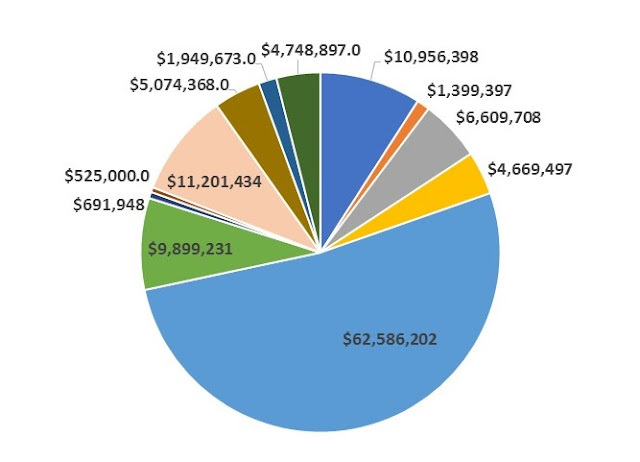 Franklin Matters: "$120,465,810 - represents about a 2.5 percent increase"
"$120,465,810 - represents about a 2.5 percent increase"
"The Town Council resoundingly passed a $120 million fiscal year 2018 budget at the end of a brief meeting Thursday night. The session featured the second of two public budget hearings required by the town charter. No Franklin resident offered a comment. The vote was complicated by the fact that Councilor Glenn Jones is an instructor at the Tri-County Regional Vocational Technical High School. The town’s contribution to that school was among the line items in the proposed budget. Council members remedied the situation by amending the budget motion into two votes: one for the $2.73 million item for regional schools, and another for the remainder of the budget. Jones abstained from the first vote, and took part in the second; both votes passed without opposition."